Just playing draw something it actually reminded me of an old report I wrote about what will happen in 10years tech while I was still studying industrial design. Not that I wrote about this game but mostly about a search engine with the use of sketch or uploading an image. The development for it to work better over the time is that people would actually draw with it and each time by collecting the data it would improve. If the developers of draw something are smart enough to actually save the data of everything people drew with a certain word, the amount of information is actually useful to develop such a sketch search engine as every stroke was recorded how people draw certain objects. However doing a little research there is already someone developing it since 2006. Cause for me as a logo designer it is a very useful tool for me to find if there are already similar designs t there or not. Especially you do not want to have an identical logo as another company by accident. 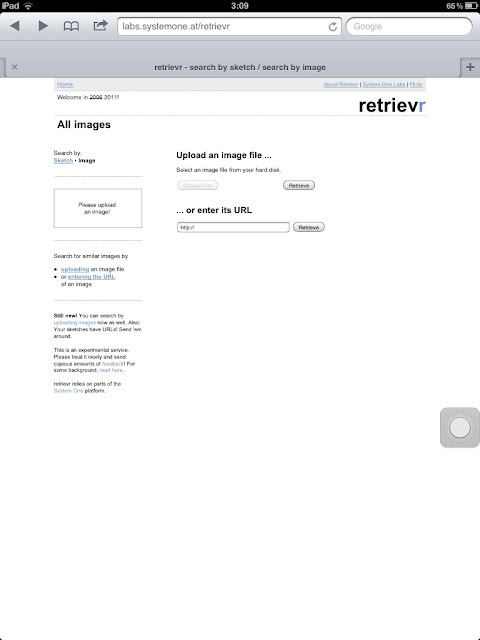 The search engine is called Retrievr. You can check it out by following this link http://labs.systemone.at/retrievr .Only bad is that it uses Flash and I can not open it with my iPad. It would be great if the would make an html5 version. Cause I was thinking of developing this too back then but had total limited knowledge of this kind of coding nor knew people who could code it. However this is a useful tool for designers to find their own works online and to double check their designs. And for photographers they could check for their photos if everybody who used the picture actually bought it from them and not just copied and erased the watermark. However it be great to if their be an apps for this kind of search engine. Have to say how it develop in my report is eventually to be sold to one of the bigger search engines as its hard to be just a search engine for only sketch and images and not for the rest.